With cloudy weather comes rain. Driving in the rain is undoubtedly more risky than driving in dry conditions. In fact, the safest way to drive in the rain is to wait for the rain to pass. However, that isn't always possible so we have a few invaluable tips to help you drive in the rain. The most important parts of your car while driving in the rain are your lights, wipers, and tires. Staying visible in the rain will not only help you, but it will also help other drivers from crashing into you. Having your taillights and headlights working is the best way to stand out in rainy weather, even if it is only misting. Fresh tires keep better traction on the road which means safer driving. Old tires wear down and lose the rubber that helps you stick to the road. Windshield wipers need replacement every six months. If you are not able to see out of your windshield, you are a danger to yourself and others on the road. Once you are behind the wheel, it is time to hit the road. Driving in the rain requires you to keep extra distance between you and the car ahead of you. This will help you slow down and avoid hard braking. Slamming the brakes in the rain can have devastating effects on slippery roads. Hydroplaning occurs when you drive over larger pools of water. Your car will slide along the road due to a loss of traction on the road. If this happens to you, pull your foot off the gas and steer into the direction you want to go. Braking while hydroplaning can worsen the problem so it is important to decelerate first. Wet roads are worst after a long dry spell. During dry weather, oil, rubber, and dirt settle into the asphalt. When it rains, these materials rise to the surface. This makes the road slicker and harder to drive on. 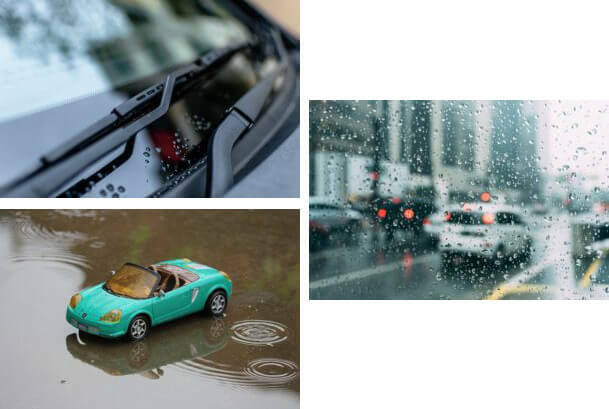 Even with all these tips and tools to help you drive in the rain, the key to it all is the driver. Metro Nissan of Montclair wants every driver to stay vigilant and safe on the roads this season.